Alexander László (born Sándor ("San") Totis, 22 November 1895 Budapest - 17 November 1970 Los Angeles) was a Hungarian-American pianist, musical composer, arranger and inventor. László studied piano at the Franz Liszt Academy of Music, and started as a pianist at the Blüthner Orchestra in Berlin in 1915. He gave piano recitals in Germany and Europe in the 1920s, and was a music director and professor of film music in Berlin. 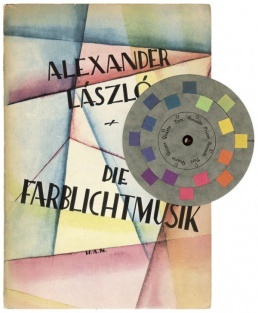 In 1925 he wrote a book entitled Die Farblichtmusik [Color Light Music], followed by another one next year. The first public presentation of László's color organ took place in Kiel in 1925. He subsequently spent two years traveling throughout Germany with his color-light music. Beginning in 1928, he turned to film music. He also participated in many Jewish lead charities. In 1933 he returned to Hungary, working in film dubbing and composing film music. In 1937 he made the film Magyar Triangulum. In the late 1930s he emigrated the United States, starting in Chicago as music professor at the IIT Institute of Design. In the 1940s he was music director at NBC Radio. In the late 1940s and the 1950s he wrote music for numerous films including The Great Flamarion (1945), The Amazing Mr. X (1949), Tarzan's Magic Fountain (1948), Night of the Blood Beast (1958), Attack of the Giant Leeches (1959), Beast from Haunted Cave (1959) and The Atomic Submarine (1959), and television series including Rocky Jones, Space Ranger and My Little Margie. This page has been accessed 6,354 times.